The blue fox (alopex lagopus forma domestica) belongs to the farmed foxes from Scandinavian. Blue foxes are one of the most popular foxes, and they are suitable for coloring due to their light, natural hair color. The hair of the blue fox is rather shorter compared to other farmed foxes. The touch and feel are very soft and fluffy. Responsible handling of the natural product fur is our concern, and therefore we only use fur skins from well-known fur auctions. If you decide to buy a product from Scandinavian blue fox, you can be sure to get a first-class natural product from guaranteed excellent European farms. 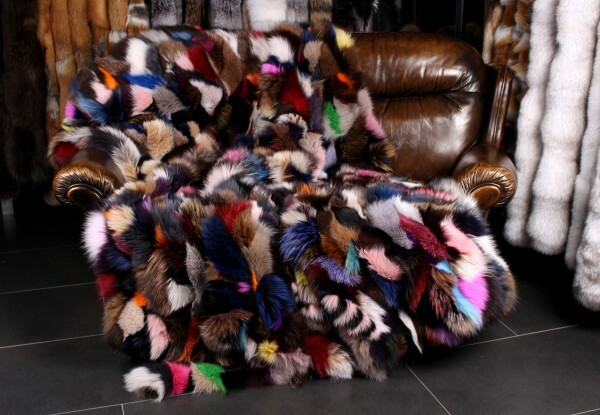 We produce blue fox blankets, fur cushions, and accessories. If you have any questions regarding our blue fox fur blankets, please do not hesitate to contact us. Related links to "Blue Fox Fur Blanket in multicolor (Fox from Scandinavia)"
Customer reviews for "Blue Fox Fur Blanket in multicolor (Fox from Scandinavia)"
Excellent customer device and prompt delivery... 5 stars. ! European Red Fox Fur Throw "Dark Type"